TE Connectivity (TE) has introduced a new Category 5e (Cat5e) quad high-speed data cable for railway rolling stock and infrastructure. With its halogen-free flame-retardant polymer insulation, the cable complies with EN45545-2, the new European standard covering fire behavior of materials and products in railway rolling stock. This is because its crosslinked outer jacketing provides high resistance to chemicals, mechanical stresses and extreme temperatures. It can be supplied on its own or in pre-assembled assemblies with connectors, for ease and speed of installation. 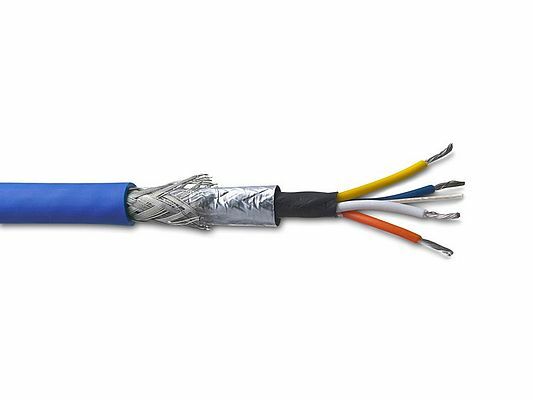 The new Cat5e data cable is a quad design consisting of two pairs of 22-AWG cores. It is designed for an operating voltage of 300 V. The electrical resistance of the conductor is less than or equal to 60 Ω/km, and that of the shield is up to 120 Ω/km. The insulation has a resistance of over 500 M Ω/km (all at 20 degrees Celsius). As the aerospace industry shifts towards more electric aircraft, manufacturers are installing more electric motors, actuators, control systems, sensors, diagnostics and electronic systems.